So, you’re finally realizing your dream of owning a small convenience store. You’ve got the perfect location and are now looking for the best equipment. How about starting with refrigeration? Depending on the size of your store and the items you’re offering, decide the one which you should buy. Considering the trend, we suggest purchasing a glass door cooler. Glass Door Coolers have gained popularity in the past few years. These units offer great display, and keep bottled beverages, salads, wraps and grab-and-go snacks chilled and at safe-serving temperatures. This is one the most incredible features of glass door coolers. They offer great display of your food items. Some glass door cooler manufacturers offer LED lighting which further enhances the display of food items. Because the items that go into your refrigerator are categorized as low involvement purchases, they are easy picks for customers. Visitors can clearly see things that are displayed in the cooler which results in increased sales. With unique display, customers will be able to grab a drink for their take-out meal, snacks for their on-the-go breakfast or bottles of soda to take home for a party. Not only does it increase sales, but also saves time as the contents of the cooler as always on display. Maintaining a glass door cooler is extremely affordable. Cleaning them does not take up a lot of time. Majority of the glass door coolers are equipped with casters. They play a huge role in easy maintenance of these coolers. Additionally, these appliances are designed with a ‘no-frost’ feature. This keeps them from that nasty looking frost build up that accumulates rapidly due to frequent door openings and humid temperatures. Glass door coolers are available in a wide variety. Choose between a 2 door cooler and a 4 door cooler. 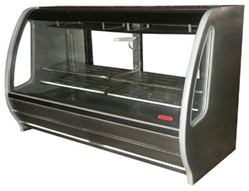 Some coolers are equipped manufactured with a sliding door while others with sliding lids. Depending on your use and space, you can either select a countertop glass door cooler or a reach in cooler. Thus, purchasing the right glass door cooler depends on your use and the food items you’re looking to store. Explore our wide range of commercial glass door coolers and choose the one that suits your business the best! At Chef’s Deal Restaurant Equipment, we offer a variety of affordable restaurant kitchen equipment.